From last year’s NBA fixture – enjoy the video. This year catch all the action on ESPN. See last week’s post for the schedule. We look forward to another great year building fabulous new Timber Sports Floors for local competition here in Victoria and Tasmania. The State Government here continues to roll out major PPP (Private Public Partnership) projects for Schools throughout Victoria. Nellakir are pleased to announce a solid continuing involvement, with new projects commencing from January to February. These competition level Sprung Timber Sports Floored Courts are used for school, local competition, gymnasiums and assembly halls. Locations include Banyule, Springside West and Keysborough College. As well we will continue to develop major competition Sports Flooring at Stadiums such as Bendigo Stadium (opened a major new court built by Nellakir this year) and Eagle Stadium in Melbourne’s fastest growing region of Wyndham (Werribee). Stay safe these holidays and see you next year. Warriors guard Stephen Curry has missed 10 games while dealing with a groin injury, but Steve Kerr says he’ll return soon. Curry suffered the injury in a 134-111 loss to the Bucks, and Dub Nation has experienced some serious drama in his absence. Curry is the glue holding the team together, and getting him back should help Golden State get on track. According to ESPN, Curry will not play in their highly anticipated matchup with the Raptors on Thursday. However, Warriors head coach Steve Kerr says he will play again against the Pistons on Saturday. Even though Curry has been out of commission for a lengthy stretch, he ranks fifth in the NBA in 3-pointers made with 62. He’s shooting 49.2 percent from deep so far, which is a career high. The Warriors are 15-7 and only behind the Clippers in the Western Conference standings. Many see the 18-4 Raptors as the biggest threat to the defending champs, so they hoped to see both teams at full strength. Draymond Green is still dealing with a toe injury, but Curry, Kevin Durant and Klay Thompson will provide Golden State fans with plenty of excitement this weekend. Nellakir are proud to be involved with the current Victorian Schools Building authority projects underway at Pakenham, Yarrambat, Aitken hill and Burnside. As well Nellakir have undertaken new multipurpose court construction at Banyule Primary School and Lalor Gardens Primary School with works commencing early next year. What’s the Stephen Curry connection? Stephen Curry ‘cut his teeth’ as a junior playing for the Knox Raiders as a ten year old. Back then Basketball Courts with Sprung Timber Flooring were the exception. Now with nearly all new schools to feature a multipurpose court – our next champions are getting a feel for real competition surfaces. For expert construction and maintenance on all Timber Sports Flooring call now on 9467 6126 or leave your details here for a prompt response. The Bendigo Stadium Redevelopment – new pictures. Recently we featured the opening of the Bendigo Stadium’s new show court – the premium sports arena in Central Victoria. Nellakir are proud to have built the new premium sports flooring surface (Sprung Timber Sports Flooring by ASF Horner Sports Floors) in collaboration with the appointed builder Fairbrother Pty Ltd. The new court and surface are of a standard to permit NBL games to be played on the FIBA (Federation of International Basketball Associations) approved surface. The first game was played there on the new court in June. It was a women’s Basketball match between the Bendigo Braves and the Sandringham Sabres. The Braves won by 32 points. The Bendigo Stadium is a major asset of the greater City of Bendigo and the ideal venue to host major sporting and entertainment events. Facilities include 7 indoor sports courts, major exhibition and function areas, a licensed clubroom and associated administration facilities. The Stadium has the flexibility to be used for major sporting, cultural or entertainment events. The Bendigo Stadium attracts 10,000 patrons each week for major sports events, concerts, dinners, conventions, trade shows and special events. It operates as a sports venue for regular competitions and as a licensed club catering for 6000 members. Nellakir are Victoria and Tasmania’s leading supplier and installer of Sprung Timber Sports Flooring. Through leading edge technology – Nellakir are exclusive agents for Australasian Sports Floors Horner Pty Ltd in the region – Nellakir has constructed many of the state’s major stadium’s flooring..
Nellakir continue to construct Sports Flooring in major stadiums, regional facilities, schools and community centres. Nellakir offer real experience and real expertise. The Nellakir package includes a follow up maintenance package that will ensure a competitive surface for the lifetime of the court. So whether it’s annual cyclical maintenance of sports flooring – recoating, linemarking or eventually re-sanding and recoating, call Nellakir now on 9467 6126 for premium expert service. Or leave your details here and one of our consultants will respond to your enquiry promptly. This year Nellakir has focussed a lot of attention on developing new facilities in both existing and new schools. From full Basketball/Netball Courts at competition standard, to Drama Rooms where special flooring and staging is created, and even Dance Floors – Nellakir are the Sprung Timber Flooring experts. All Sports Flooring utilises Australian Sports Flooring systems (ASF) and is simply the highest standard. This week sees the Viewbank College project, a Drama Room, purpose built with specialised timber flooring nearing completion. As well at Mercy College in Coburg, the materials to develop the sprung timber flooring for their special purpose flooring have now been delivered. Work will start in the very near future. Basketball/Netball Courts are being commenced in the next few weeks at both Bentleigh Primary School and at Carnegie Primary School. The courts will be utilised for competition after hours by the local communities. Courts are also being constructed at the Sandringham East Primary School, the Port Melbourne Primary School and the Springside West Secondary College located at Fraser Rise, on the western edge of Melbourne near Sydenham – a new school. Another Drama Room is to be built at Keysborough College with Nellakir building a purpose designed sprung timber floor and staging. At Federation University in Ballarat the Nellakir team have commenced building a purpose built Dance Floor. This is at the Mt St Helen’s Ballarat Campus. Again it is a sprung timber dance floor, which in itself is interesting as all dance floors in Ballrooms and historic homes were always Sprung Timber flooring. Two well known community buildings have received a full maintenance makeover recently. The first is the Lynda Blundell Community Centre in Blair St Dallas, a community venue of long standing in the Broadmeadows area, the hall floor and stage were fully sanded and recoated (resealed). The second such building is the Kelly Park Centre in Werribee, a popular community venue where again the Hall area flooring and stage were re-sanded and recoated (resealed) as well. And to end the report, the new Basketball Court at St Francis College Beaconsfield has now been completed. With the previous court being water damaged beyond repair, Nellakir have now built a new competition level court featuring Sprung Timber Sports Flooring. If you or your organisation require a Maintenance Program, repairs or perhaps a complete re-construction of your Sports Flooring, don’t hesitate to call Nellakir on 9467 6126 or leave your contact details here and one of our helpful staff will get back to you to make an appointment for a free, no obligation quote. Nellakir – for Expert Construction and Programmed Maintenance of all Sports Flooring. Nellakir have now completed the new replacement Sports Flooring for Rowville Community Centre’s Basketball Courts, and it’s agreed by all it’s come up a real treat. This week the South Melbourne Multi Storey Primary School Basketball Court in Ferrars St South Melbourne also reaches completion. And if you love Basketball, here’s the final excerpt on Tips for Defence. Play Ball! 26. Are They a Great Outside Shooter? The number one factor that determines how you should play against your opponent on defense is whether they can shoot the basketball from the outside at a high percentage. If you’re guarding a poor shooter, then you can assist your teammates with more help off the basketball and you know that when playing on-ball defense you can take an extra step back to defend the drive without fear that they’ll make the shot. If you’re guarding a great shooter, you won’t be able to help as much and you must be more mindful of your rotations on defense. Instead, you should close the space between you and the defender and force them to dribble inside and take a lower percentage shot. This is why smart basketball coaches put great off-ball defenders on poor shooters. 27. Where/How Do They Score Most of Their Points? Whether they’re a great outside shooter or not, most players will have certain areas of the floor or certain ways that they score the majority of their points. To be a great basketball defender, you must work out where and how your opponent does most of their scoring. Do they get most of their points running off screens and getting midrange shots? Do they score most of their points driving to the rim and finishing with their right hand? Do they have a deadly midrange pull-up game? Are they a low-post specialist? These are questions you must figure out the answer to for every offensive player that you play against. 28. Do They Prefer Dribbling With Their Right or Left Hand? Figuring out whether to influence your opponent’s dribbling to the right or left is one of the most important and easiest things you can do to improve your defense. How you’ll implement this knowledge during the game might vary due to team defensive rules, but understanding their preference is crucial. More often than not, the player you’re competing against will prefer to drive to their right hand. To force them to their opposite hand, position yourself so that you’re slightly overplaying their preferred side and then establish a higher lead foot on this side too. From this stance, the only way they can drive on their preferred side is to dribble through your chest and receive an offensive foul or to retreat dribble around you which will provide enough time to establish position again. If they were to drive on their opposite hand, you’re still in position so that you can contain them and cut off the driving lane. 29. What Are Their Weaknesses? As well as figuring out their strengths, it’s important to know what an opponent’s weaknesses are. This knowledge will assist you to put them in uncomfortable situations by forcing them into performing what they’re not good at. This will require watching tape of your opponent, watching them play live, or simply working it out as the game progresses. Every single player on the planet has weaknesses. It’s your job to find out what they are and exploit them. 30. How Do They Respond to Pressure? One of the most surprising differences between great offensive players is their ability to handle pressure being put on them. I’ve seen many players who regularly average 25 points per game but when you put a high amount of pressure on them, their point totals automatically take a significant drop. These are often the player who can’t mentally handle pressure from great defense. They get frustrated, start yelling at their teammates, and throw up shots from all over the court trying to reach their regular scoring numbers. Conversely, there are many great offensive players who stay calm and will have the same impact as usual regardless of the defensive pressure. For that reason, it’s important to know which category your opponent falls under and then use that knowledge to improve your defense against them. 31. Do They Crash the Offensive Glass? There are many players who do a fantastic job of sprinting in for offensive rebounds and then either scoring or passing out to a teammate for an open shot. Shots after offensive rebounds always seem to be great shots. As a defender, you must be aware whether the player that you’re guarding has a tendency to sprint in for offensive rebounds or to run back on defense after each shot. If they are a great offensive rebounder, you must ensure to make contact with them after every shot and put a high importance on keeping them off the glass. 32. What Offense Are They Running? Once you figure this out, the next step is to determine the best way to defend against it. How do they initiate the offense? What’s the regular passing sequence of their offense? Where do they take most of their shots from? For example: If an opponent’s offense always starts with a pass from the top to one of the players on the wing, you then know that if you completely deny this pass then you’ve effectively taken them out of their offense. Often you’ll come across teams that don’t have an offense at all and will rely solely on set plays to score the basketball. Since most youth and high school teams only have 2 – 3 set plays that they run a majority of the time, it can be relatively simple to figure out the name of the set play and what their actions are. Just like the previous tip, your goal is to figure out what the opposition are trying to do and then take those options away from them. The best time to do this is before the game. Watch video of the opposition’s offense or to watch them in-person and focus on figuring out what they do offensively. If you don’t have that opportunity, with focus you can figure it out throughout the game as you’re competing against them. While the main goal is containment, we don’t want players to do this by standing 2 meters off their opponent and giving them wide open shots. Players must learn how to contain their player while also putting constant pressure on them when they have the basketball. The purpose of putting pressure on the basketball is to make the offensive player uncomfortable which will often lead to deflections and turnovers. When a player is uncomfortable from on-ball pressure, they don’t want to dribble the basketball, they’re scared that one of their passes will get deflected, and they don’t even think about shooting. As long as your teammates are playing great help defense, you shouldn’t hesitate to apply on-ball pressure because if the offensive player does happen to beat you off the dribble, your teammates are ready to rotate and stop the basketball. 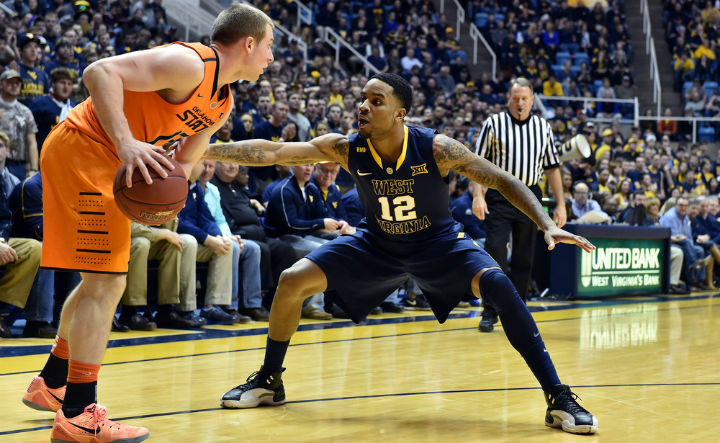 When you’re playing on-ball defense, you should always be lower than your opponent. If you’re roughly the same height, your eye level should be at approximately their shoulder level. Being lower gives you better balance and allows you to react quickly once the offensive player makes their move. As always, the quicker you can react, the better. This tip goes back to the importance of balance that I talked about in the first section of this article on basketball defense. When you lunge for the basketball, you’re often putting yourself off-balance and out of correct defensive position. If the basketball comes within your reach, by all means, attempt to tip it and secure the steal, but never lunge out of position unless you’re over 75% sure you’re going to steal the basketball. Always remember that containing your opponent is your number one priority when playing on-ball defense. One of the most common questions I get asked by players is how close they should be to their opponent when playing defense. On average, a player should be approximately one arm’s length away from their opponent. This means that if you stick your hand out straight, you should just be able to touch the offensive player with your fingertips. As players improve to higher and more skilled levels of basketball, the distance will start to vary depending on the tendencies and abilities of the player they’re guarding against. But for the youth and high school level, this is often the most appropriate distance. Being an arm’s length apart is the perfect length because it’s close enough that the defender can get a hand on the basketball for a steal and also prevent the shot, but far enough away that if the player attempts to drive there’s enough to react and adjust defensive position. This tactic will make an immediate impact on your defensive ability. When players are still learning the game, the natural tendency is to look at the basketball or the eyes when playing on-ball defense. The problem with doing this, however, is that it’s easy for the offensive player to fake with their eyes or the basketball and get the defense off-balance. So, what should players be looking at while playing on-ball defense? The mid-section of their opponent. This being anywhere from their chest to their waist. Unlike the other parts of their body, it’s incredibly difficult for the offensive player to fake with their mid-section which is why that’s where I recommend players focus on. While you’re playing on-ball defense, you should be tracing the basketball with one of your hands at all times. Doing so will allow you to deflect the basketball if the offensive player makes a quick pass inside and also simply discourages passes as your opponent knows you may get a hand to it. Your other hand should be below the basketball looking to tap the basketball out of their hands or to poke it loose if the decide to dribble. By leaving your hands down at your sides (which a lot of players do), you’re not achieving anything defensively. Most players have formed a bad habit of swatting down on the basketball when attempting to reach in for a steal. The problem with doing this is that the referee will often call the defender for a foul. It looks aggressive and there will often be contact made with the arm. The better way to steal while playing on-ball defense is to swipe up at the basketball. This means keeping one of your hand’s lower than the basketball with your palm facing up. Since the defender should be playing lower than the offensive player, this is a far more successful method and will result in fewer foul calls. A cardinal on-ball defensive sin is jumping up and swatting at the basketball attempting to block an opposition player’s shot. It’s incredibly difficult to block an outside shot without fouling. The shooting motion of most players will often bring their arms directly into yours on the shot resulting in a foul. If you jump on a shot fake, it’s game over. They’re going to have an open drive to the rim and if they don’t score themselves, they’ll often be able to pass to an open player for the shot or layup. Instead, the best option you have when defending an outside shooter is to get your hand up to their face and take away their vision of the rim. A missed shot is just as good as a blocked shot. Often better since most blocks are out of bounds or straight back to the opposition team. This tactic allows you to stay on the ground and react quickly to whatever happens next. One of the primary rules of defense is to never allow your opponent to cut ball-side of you after making a pass. This most commonly occurs on a pass-and-cut when the opposition is swinging the basketball around the perimeter. After making the pass, they will immediately look to cut ball-side for the for the give-and-go pass leading to an open layup. Great defenders never allow this to happen. Any time you’re guarding a player and they pass to a teammate, you must immediately jump towards the basketball on the flight of the pass. This removes your opponent’s opportunity to cut ball-side and forces them to cut behind which is a much more difficult pass to make and puts you in prime position to intercept the pass if it’s attempted. Even if they choose not to cut, you’re immediately denying the return pass to the player you’re guarding. 43. One-Pass Away – Deny or Help? One of the most important principles of your team’s defensive system you must understand is whether to deny when one-pass away or whether to be in help position. This is the main difference between the two most popular defensive systems: The man-to-man defense (deny) and the Pack Line defense (help). 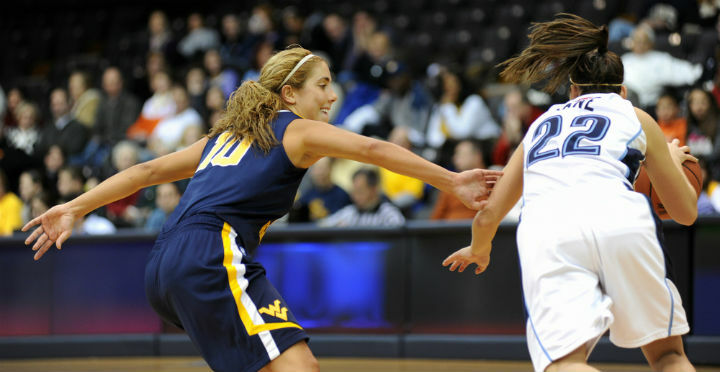 If you’re denying the pass, you should always have one arm and one foot in the passing lane, your chest should be facing your opponent, and you should see the basketball by looking over your ball-side shoulder. Another thing to keep in mind is that the defensive system may not have a universal rule on this. The rule may change depending on where the basketball is on the court. For example, some coaches prefer to allow the initial pass to the wing and then deny after that pass has been made. Others might allow passes to the corner by playing in help position but deny any reversal pass back to the top of the key. Make sure you understand your team’s defensive strategy when defending one-pass away from the basketball. Close outs are one of the most difficult skills to master on defense. In fact, there any many offenses and set plays designed specifically to create defensive closeouts as that’s often where a lot of defenses break down. There’s no avoiding them. If your team is in help position (which they should be), then there will be close outs no matter what. So how do you perform them effectively? The key to closing out is to sprint approximately two-thirds of the way to the defender and then use short, choppy steps to finish the close out. As a player gets close, they should be low with their weight back to absorb the drive and also have one hand up to deter or contest the shot. The corner three-point shot is arguably the most efficient shot in the game of basketball. You should never leave this shot open. A player will most commonly make this mistake when an opponent drives to the rim from the wing and they’re defending a player in the corner one-pass away. Instead of staying on their opponent, this corner defender will drop down to help stop the drive to the rim leaving their player open for the simple pass and wide open jump shot. Every player must understand that help comes from the middle. That’s why you must always have a defender on the split-line. Help never comes from ball-side corner. They can quickly plug and recover to their player, but they should never completely commit to helping on the baseline wing drive and leave open their opponent in the corner. Whenever you’re on defense and you’re not defending the basketball or one-pass away, you should be in a ‘defensive triangle’. The defensive triangle (or ball-you-man) refers to positioning yourself between the basketball and your opponent so that you can see both with your peripheral vision. You should have one hand pointing towards the basketball, one hand pointing towards your opponent, and your vision should be in-between the two. If a direct chest pass was made between the player with the basketball and your opponent, the help defender should be able to intercept it. A defender should be as close to the basketball as possible but still close enough to their player that if a skip pass to them was made, the defender would have time to close out and establish defensive position without allowing an open shot. The reason for this is that the closer a help defender is to the basketball, the quicker they can be to play help defense. A great basketball defender never stands still while they’re on defense. They’re constantly adjusting their positioning the entire possession. Whenever the basketball or your opponent moves, you should be moving as well to make sure you’re always in the best defensive position. This requires players to understand the defense to know where they should be, stay in a defensive stance to react quickly, and use the defensive triangle to keep vision of the player they’re guarding and the basketball. If you’re not constantly adjusting your position, it won’t be long before you get caught out and your opponent gets a quick backdoor layup or a wide open jump shot. Even if being caught out of position doesn’t lead to a direct score by your opponent, it will lead to a breakdown in the defense and the need for your teammates to rotate and help. This puts them out of position and usually leads to an high-quality shot from one of the opponents. Your teammates need to trust that you’ll be in the correct position to help them just as they need to be in the correct position to help you. Don’t let each other down with lazy defense. Becoming a great basketball defender is one of the most important areas a player can focus on. Since few players put a focus on defense, doing so is one of the best opportunities a player has of separating themselves from the crowd and advancing from a mediocre player to a great player. If you implement the above tips into your game, very quickly you’ll see the impact that they can have on your game.